One of the baby shopping items in first year is High Chair. If you are planning to buy a High Chair for your baby, Let us suggest you the smart 3 in 1 High chair which is a moderately priced yet maximally safe High Chair for your child. If you are in India, then the High Chair that we think you should buy is, Cherry Berry High Chair by R for Rabbits. What do we like about Cherry Berry High Chair? The weight of the High Chair is around 4.8 Kg, though this makes the chair non-portable. But the same won’t tumble or move from its place, by your baby’s constant pushings. This also indicates towards the fact that the chair has been made of heavy sturdy, anti-slippery plastic and iron rod legs. If you and your baby go out for frequent outings, vacations, holidays and trips. Then you might like buying the portable, Booster Seat Feeding Chair. But remember, it cannot be converted into your baby’s study desk and sitting chair. 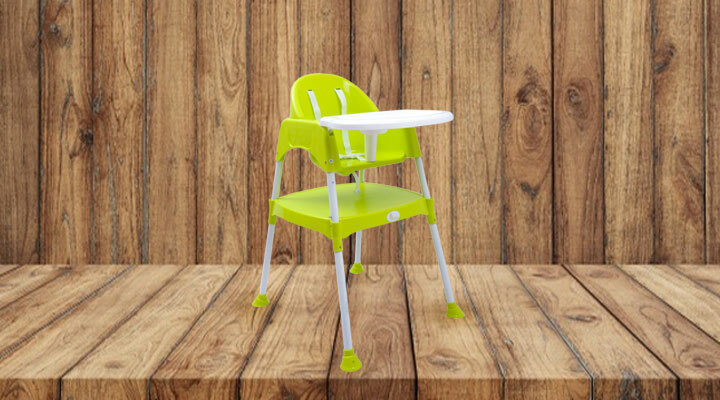 Cherry Berry High Chair’s height cannot be adjusted, but it is designed to grow with the baby. This means the Chair’s height would be suitable for use, even when your baby turns into a toddler. Also, in height adjustable High Chairs you have various locks and knobs for fixing the chair’s height. But by buying Cherry Berry Baby High Chair, you can spare yourself from all such frustrating chores. It has got 5-point safety harness. Hence like an air pilot, your baby will sit securely on the chair with waist straps and shoulder straps hooked onto him. Instead of loop and hook buckle belt, simple and easy to fasten, seat belt like safety harness has been used on the Chair. The edges of detachable dining tray, table, and armrest of the Chair have been made smoothly round. With no pointy edges, your baby is less likely to get any cuts or scratches from them. The base of the chair’s leg has been made wide with inverted-cone like structure, so that the chair doesn’t get overturned. With a non-reclining seat, you won’t have to keep on making a wild guess, whether you have set the seat’s position straight at ninety degrees or not. The non-reclining seat of the Cherry Berry High Chair will keep your baby’s straight too. On purchase of Cherry Berry High Chair, you will also get a chair fitting cushion for your baby’s back. With a comforting cushion behind his back, he would at least learn to make use of the Chair’s backrest. Cherry Berry High is easy to assemble. Now, this can indeed be a comforting factor for you, especially the time, you will disjoint it to use it as Study Desk or Sitting Chair. One more important thing, for sitting on Cherry Berry High Chair your baby’s minimum weight should be 3 Kgs and he should be at least 18 months old. Approximately, you can continue using the same Chair until he gets 5 years old. R for Rabbit Cherry Berry – The Convertible Baby High Chair The cost that you most probably spend every month, at the snap of your finger. I like how it becomes a little table and chair. How useful for toddlers. Another factor I found very important was ease of cleaning. The less crannies for food to get stuck in, the better. Love that you highlighted safety and comfortability! wow this is a really great design. a high chair that can really grow with ur baby and u can get multiple uses out of. Very informative! Will definitely take this into consideration!